The reality is that most professional historians specialize in a particular time period, and that time period can be quite small in scope depending on the individual historian’s interests. I think non-historians sometimes assume that the primary goal of studying history is the accumulation of facts. As historian David McKenzie pointed out on Twitter, historical knowledge for many is “simply cramming facts into one’s head to be spit out at a moment’s notice.” While learning facts and establishing historical accuracy are certainly important facets of any history degree program, there are many other elements of good historical practice. This includes (but is not limited to) the ability to search for and interpret the larger context surrounding a particular event, the need to understand change over time, the importance of crafting solid research questions, the talent to be a good reader, writer, and speaker, and the training needed to become well-versed in both primary and secondary source material of a particular, specialized historical era. When I struggle to answer my friends’ and family’s questions, I point out that historians are in some ways similar to musicians. My area of expertise is nineteenth century U.S. history–particularly the Civil War Era–and that is my “musical instrument,” so to speak. You wouldn’t say “oh, you’re a musician! Go over and play that guitar” without first asking that musician what instrument they play and if they could play guitar. And just because a musician can play guitar doesn’t mean they can play tuba or do a freestyle rap on the spot. The situation is similar with historians. I can talk about the Battle of Shiloh or the Civil Rights Act of 1866, but I’d have a more difficult time giving a detailed answer about, say, the Battle of D-Day or the Civil Rights Act of 1964. As much as I’d love to give detailed answers and remarkable facts about every event in human history, the limits of human intelligence require a more specific and concentrated focus. Music education students in college are required to learn how to play a string instrument, a brass/woodwind instrument, and sing in a choir regardless of their prior expertise. They also learn music theory and develop an ability to read sheet music whether it’s in treble clef or bass clef (or alto clef!). As future teachers of band, orchestra, and choir in a k-12 setting, this training prepares them to help students learn how to play an instrument, read sheet music, and perform together in an organized creation of musical sound. History students at the undergrad level receive a similar curriculum in that they take courses in U.S., European, and World history during their training. They receive a broad instruction that enables them to educate younger students about a wide swath of human history. But like the musician with a specific instrument that they specialize in and perform with in concerts, the historian finds a time period to specialize in and contribute to through public talks, the creation of scholarship, and, in my case as a public historian, by interpreting history to a wide range of publics. Yesterday I had the distinct privilege of speaking to a number of gifted ninth grade students at a local private school about the Reconstruction era. I had only fifteen minutes to give my presentation, so I had to get to the point fast. Prior to the talk I decided that I’d try my best to create a coherent and accurate visualization of how I understand the era and its political significance. I focused on two themes: How the Union would be preserved, and who had the right to call themselves an American citizen during this time. It was hard, but I think I was pretty successful in my effort to be nuanced but not overwhelming. Below is the visualization. If you’re curious about the era or plan on teaching it to others, please feel free to click the image to view at full size, download, and share with others (with appropriate credits). This description captures one of the most fundamental quandaries of human existence: when should individuals and groups make compromises on ideals to accomplish an objective, and when is refusing to compromise the better option of the two? Studying history is a worthwhile endeavor for considering the ramifications of political compromise on the health of a nation-state and its people. It was with this conception of compromise on my mind when I read historian Carole Emberton’s fine essay in the Washington Post and Caleb McDaniel’s in The Atlantic today on the breakdown of compromise efforts leading up to the Civil War. White northerners and southerners forged successful compromise efforts (at least in the minds of those seeking political union between the sections) on the issue of slavery from the beginning of the nation’s founding. As the country acquired new western territory through conquest and purchase in the years before the Civil War, debates continually sprang up about whether the institution of slavery would accompany the white American settlers moving westward. In hindsight, various compromise efforts like the 1820 Missouri Compromise, the Compromise of 1850, and others were really measures to appease the proslavery south, but they nonetheless allowed the Union to be maintained for nearly eighty years after its founding. It’s worth asking students of the Civil War to consider how compromise over slavery was possible in 1850 but not in 1860. My answer would be that the Republican Party’s successful entrance into electoral politics changed the game. The Republicans explicitly organized as a party in 1854 on the principle that slavery should be banned in the western territories and left open for free labor (for some Republicans, this meant only free white labor). Although Abraham Lincoln acknowledged that Constitutionally speaking slavery could not be touched where it already existed in the south, his personal hatred of slavery was well-know and feared by proslavery fire-eaters who saw his election as a step towards federal governance dominated by northern anti-slavery convictions. In other words, an administration that was hostile to the south’s economic, political, and social interest in keeping African Americans enslaved. Is President Donald Trump like Andrew Jackson? Wait, maybe he’s more like Andrew Johnson. Over the past week historians have been debating the merits of using historical analogy to educate lay audiences about the messy circumstances of our current political moment. Moshik Temkin started the discussion with an op-ed in the New York Times decrying the “historian as pundit” persona that, as can be seen above, has gotten attention within the online realm (not all of those essays were written by historians, but you get the point). Temkin expresses worries about “the rapid-fire, superficial way history is being presented, as if it’s mostly a matter of drawing historical analogies,” which in turn simplifies, trivializes, and downplays the significance of both past and present-day events. Conversely, many historians on my Twitter feed reacted negatively to Temkin’s piece, arguing that we must meet people where they are and that analogy provides opportunities for historians to demonstrate changes and continuities in American history. Is there room to argue that both sides of this argument are a little bit right and a little bit wrong? I think so. Historians have an important role in unpacking key elements of the ways that institutions operate over time to make sense of big trends and broader forces that move beyond the particular moment within which we live. We can’t become so blinded by our concern for particularity and specificity and nuance that we lose site of the big picture. At the same time, however, is Temkin incorrect when he suggests that we should be wary of poor historical analogies? Is he wrong when he asserts that we should remind our audiences that a similar event or person from the past does not lead to a similar outcome in the present? Can we conclude that some of the above historical analogies are trite and unhelpful? Are there better questions we can ask about the past and how it has shaped the present? Is their room to sometimes discuss the past on its own terms without resorting to comparisons with the present? I was struck by a recent article from a senior English major who, in discussing national politics in the classroom, warned that “if authors are only worth reading insofar as they inform modern phenomena, then the entire English canon is of mere antiquarian interest and can be summarily dismissed.” If you insert ‘history’ for the word ‘English,’ do we run into the same problem by downplaying huge swaths of history that don’t have an explicit relevance to current politics? A huge shortcoming of this entire discussion, of course, is that public historians and the work they do are completely left out of the conversation. Here’s the thing. Public historians work in small spaces all the time; spaces that are more often then not much smaller than the ones academics use. We don’t get sixty minutes for lecture, 400 pages to write a book, or even a New York Times opinion piece. We get ten minute introductions, tweets, short Facebook posts, museum exhibits that are often viewed for ten seconds or less, and other educational programming of short duration. Both Temkin and his critics leave this important work out of their discussion. So here’s a strong middle ground from which to argue. Historians should always strive to meet people where they are in their learning journey. They ought to embrace opportunities to give talks, speak on news shows, be quoted in a newspaper article, or write op-eds for a media outlet with a large platform. At the same time, they ought to use historical analogies responsibly and within the context of highlighting the importance of studying history. The past itself is interesting on its own terms, and sometimes it’s okay to discuss it without resorting to a comparison with Donald Trump. And perhaps academic historians can learn a thing or two from public historians about conveying complex historical subjects into clear, accessible interpretations of the past to a wide range of audiences. The historiography of the Reconstruction era has and continues to be overwhelmingly focused on questions of race, citizenship, and equal protection under the law in the years after the American Civil War. For an era of remarkable constitutional change and the dramatic transition of four million formerly enslaved people into citizens (and, for some, into voters and elected leaders), this focus is understandable. Reconstruction-era scholars almost unanimously agree today that Reconstruction was a noble but “unfinished revolution” undone by an end to military rule in the South in 1877 and an apathetic white North no longer interested in protecting black rights, which in turn allowed unrepentant, racist white Southern Democrats to overtake their state governments and impose Jim Crow laws that ushered in a long era of white political supremacy throughout the region. The “unfinished revolution” thesis is undoubtedly true, but there is more to the story of Reconstruction than the question of Black Civil Rights (although the importance of that story cannot be overstated). The country’s finances were in shambles and questions emerged about the best way to pay down the federal deficit and establish sound credit; women fought for the right to vote but were denied this right when the 15th amendment limited suffrage to men only; Indian tribes throughout the west faced the prospect of rapid white westward expansion and a federal government that simultaneously preached peace with the tribes but also did little to stop white encroachment of their lands; and immigrants from mostly Southern and Eastern Europe began to settle in the United States, causing a great deal of consternation among political leaders about how to best assimilate these people into American culture. Regarding the latter issue, historian Ward McAfee’s 1998 publication Religion, Race, and Reconstruction: The Public School in the Politics of the 1870s is a masterful treatment of the role of public education during the Reconstruction era. I just finished reading the book and I learned a ton from it. McAfee’s thesis is essentially three-pronged. The first argument is that increasing numbers of immigrants to the U.S. during Reconstruction raised a great deal of concern within the Republican Party, especially those who had flirted with Know-Nothingism in the 1850s and held anti-immigrant and anti-Catholic prejudices. Republicans feared that these immigrants held their allegiance to the Pope above their allegiance to the U.S. and that the Catholic church kept their parishioners illiterate, superstitious, and ignorant of the larger world. These immigrants would attempt to subvert the country’s republican institutions and make America a bulwark of the Vatican. The emergence of public education during Reconstruction, therefore, was not just an effort to educate the formerly enslaved but also an effort to promote (Protestant) morals, good citizenship, and obedience to republican institutions among immigrant children ostensibly being raised on Catholic principles. The second argument relates to the division of taxpayer funds for public schools during Reconstruction. These emerging public schools during the era often incorporated Bible readings in class without much complaint. Republicans argued that Bible readings would teach good morals to students and that these teachings were appropriate as long as they took a “nonsectarian” approach that didn’t cater to any particular denomination. Most of these readings were done out of King James Bibles originally translated by the Church of England, however, and Catholics accused public school teachers of engaging in pro-Protestant, anti-Catholic teachings. To remedy this issue, Catholics established their own private, parochial schools and called upon the federal government to ensure that state tax funds for education be equally distributed between public “Protestant” schools and private Catholic schools. Republicans led the charge against splitting these funds and undertook an effort to ban public funding for “sectarian” schools. Towards the end of Reconstruction the Republicans made this issue a centerpiece of their party platform, and in 1875 Congressman James Blaine led an unsuccessful effort to pass an amendment banning public funding for sectarian schools (although “nonsectarian” religious instruction and Bible readings could still hypothetically take place in the public school classroom). While this amendment failed, 38 of 50 states today still have their own state “Blaine amendments” banning the funding of sectarian schools. The third and arguably most provocative argument from McAfee is his contention that Reconstruction failed largely because of an initiative by the radical wing of the Republican party to mandate racially integrated “mixed-race” schooling in 1874. Most Republicans were skeptical if not outright hostile to racially integrated public schools (in stark contrast to their desire to have children from Protestant, Catholic, and other religious backgrounds intermingled together in public schools). Massachusetts Senator Charles Sumner, however, was a dedicated proponent of racial integration in the schools and refused to compromise on the issue. When Congress began debating the merits of a new Civil Rights bill in 1874 that would mandate equal treatment in public accommodations, public transportation, and jury service, Sumner insisted on including a clause on racially integrated public schools. When news of Sumner’s demands became public, Democrats and conservative Republicans in both the North and South responded with outrage. Conservative Republicans in particular stated that while equal treatment in public facilities was acceptable, mandating mixed schools was a bridge too far. Republicans lost control of Congress after the 1874 midterm elections, and, according to McAfee, the cause of this loss was the insistence of Radical Republicans to mandate racial integration in schools. Prior to reading McAfee I was of the belief that the devastating Panic of 1873 was the primary reason why Republicans lost the 1874 midterms, but McAfee presents convincing evidence that the mixed-schools initiative also contributed to those losses in a significant way. 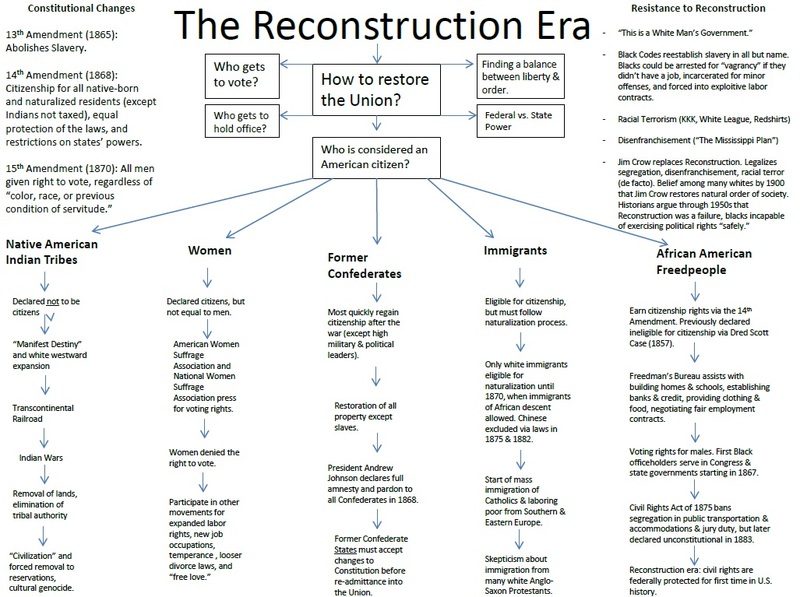 With Democratic control of Congress now assured, Reconstruction’s future was doomed. A Civil Rights Act was passed in 1875–largely in tribute to Sumner after he died in 1874–that mandated equal treatment in public facilities and jury service, but the clause mandating racial integration of public schools was removed. In any case, the Supreme Court in 1883 determined in Civil Rights Cases that parts of the Civil Rights of Act of 1875 were unconstitutional because, according to the court, the 14th amendment requiring equal protection of the laws only applied to the actions of the state and not the actions of private individuals and organizations. Religion, Race, and Reconstruction is a fine piece of intellectual history that brings life to a long-forgotten element of Reconstruction history, and I highly recommend the book to readers of this blog. In looking back at this recent and torturous U.S. Presidential election, I believe the blatant and irresponsible sharing of fake news, inaccurate memes, and outright propaganda, combined with a general lack of civility and informed online conversation, contributed in some way to Donald Trump’s electoral victory. I do not mean to suggest that there were no other factors that contributed to this particular outcome or that people on the left side of the political spectrum don’t also share fake news and stupid memes – they do. But evidence is mounting that fake and inaccurate news–particularly Pro-Trump news–is widespread on social media and that many people regardless of political preference take misinformation seriously if it lines up with their own personal and political views. Facebook is especially bad in this regard. The chances are good that many voters who are also Facebook users went to the polls and made their respective decision based partly on false information gleaned from articles shared on their news feed. Professor Mike Caulfield’s particularly sobering analysis of fake articles created by a fake paper, the “Denver Guardian,” that spread like wildfire across Facebook demonstrate how easy it is to get duped by someone with an agenda and basic computing skills. Friends and family that I care about have also engaged in this sharing of fake news on Facebook, which I find deeply troubling. Facebook has evolved into a news-sharing website without creating a mechanism for effectively moderating fact from fiction, and at the end of the day the site isn’t fun anymore. I haven’t checked my account since the election. As a historian and educator I have stressed on this website the importance of teaching not just historical content in the classroom but also historical methods. When we teach both content and methods, we convey to students the idea that history is not just a mess of names, dates, and dead people, but also a process that enables students to conduct research, interpret reliable primary and secondary source documents, and ultimately become better writers, readers, and thinkers in their own lives. I think that now more than ever these skills need to be taught not just for their utility in understanding the past but for also parsing through the vast multitudes of information that bombard our social media feeds on a daily basis. Historians have much to contribute to contemporary society and they should lead the way in accomplishing this important work. When we learn to think historically, we enable ourselves to become more informed citizens who have the ability to participate in electoral politics with an understanding of the issues at hand and how our system of government operates. I am interested in hearing from history teachers about what methods, tools, and practices they employ when teaching students how to distinguish between reliable and unreliable sources and how to interpret these sources to construct informed arguments and narratives. Sam Wineburg’s scholarship has been instrumental in my own thinking about these topics, and I believe everyone should listen to or read his keynote address at the 2015 meeting of the American Association for State and Local History. I have also utilized historian Kalani Craig’s guide on the 5 “Ps” of reading primary sources, which is equally relevant when assessing sources on contemporary topics. What has worked for you when teaching others how to assess and interpret documentary sources? Please let me know in the comments.